As technology evolves GPS enabled devices are becoming more prevalent. They can be found in stand-alone units, built into vehicles and running off smartphones. 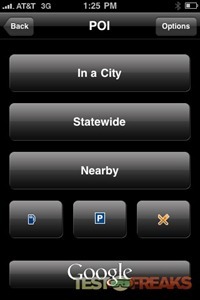 The iPhone has been GPS enabled for quite some time and there are numerous GPS style apps available for it. 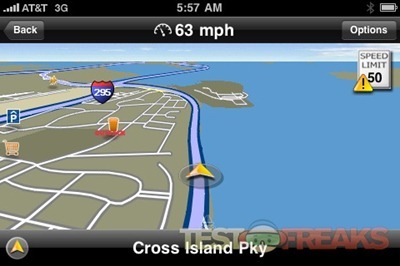 Today we will look at one of the more popular GPS apps – the Navigon MobileNavigator for the iPhone. This app is designed to give the iPhone all the functionality of a stand alone GPS unit while offering other features that may only be found in more expensive GPS models. Some of these features include social networking integration via Facebook and Twitter, the ability to use Google Local Search for destinations as well and integrated iPod control. Navigon is a highly regarded name in the world of GPS devices and they have created an app that works like dedicated GPS devices. The Navigon MobileNavigator comes in two flavors – as a complete GPS solution with maps of both the United States and Canada or as a regional version, which offer maps of either the US East, US Central and US West. The regional map based versions of MobileNavigator are cheaper than the complete version so if you only need the GPS for one specific area and want to save money then getting the regional version may be the better option. 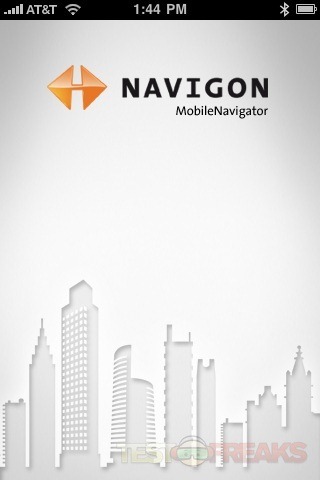 The Navigon MobileNavigator icon launches the app. 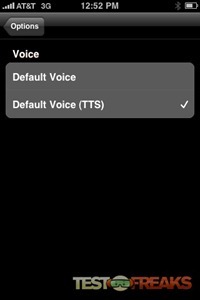 Due to the iPhone’s built in accelerometer the user can orient the iPhone in either portrait or landscape mode for GPS function. Most people will probably prefer the landscape view as that is how dedicated GPS units are designed to be viewed. The home screen (Main Menu) consists of four onscreen “buttons” and five dock selections. These buttons include Enter Address, Search for POI (Point of Interest), Take Me Home and Show Map. The dock choices are Main Menu, Favorites, Recent, Contacts and More. 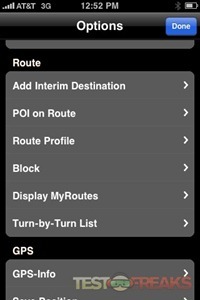 The Main Menu screen provides the user with navigation options and should be familiar to anyone who has ever used a GPS. The Favorites, Recent and Contacts are all additional ways to find stored addresses. From the More subscreen Route, Extras, Options, Coordinates and Direct Help options are presented. One feature that the Navigon MobileNavigator offers under the Extras option is the ability to make in-app purchases of Traffic Live which provides instant traffic reports and Panorama View 3D which gives another map view. Direct Help is another interesting feature which provides the user’s current location via address and co-ordinates and lists the local Roadside Assistance, Police Station, Hospitals and Pharmacies. 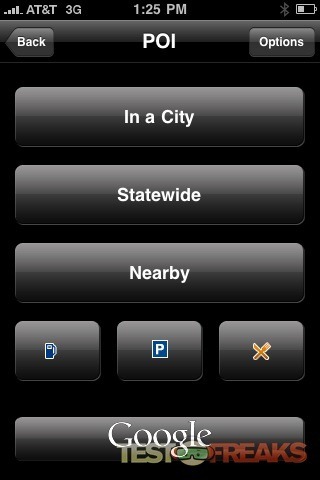 From the Options menu the uses can change he Map Display, Route, GPS and General settings. Under the General settings Facebook and Twitter accounts can be managed along with iPod playback mode among many other options. 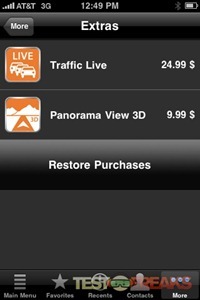 Transform your iPhone into a mobile navigation device with a variety of useful functions. The NAVIGON MobileNavigator is easy to use and provides information on route distance, time of arrival, motorway services, filling stations, speed limits and border crossings. What’s more, special destinations such as theatres, hotels, shopping centres and other sights are already integrated. Thanks to smart address input and realistic map display, you never lose track and always reach your intended destination safely. The pocket navigation system is a great companion – not only in the car – and is also ideal for optimum route planning and navigation for cyclists and pedestrians. The new route guide for your iPhone – the ideal companion for all frequent travelers. You now can choose one of three map cuttings that suits you best at a very attractive price: U.S. West, U.S. Central or U.S. East map region. If needed, you can activate the other map regions easily through In App Purchase right from your iPhone for an even lower price and no additional download is required! Installation of the Navigon MobileNavigator takes a fair amount of space on the iPhone as the file comes in at a hefty 1.5 GB. Even the iTunes download on a fast internet connection took around ten to fifteen minutes. Navigon also requires double the amount of free storage to install the app. Once the app is installed this additional free space can be used by the iPhone. I needed to delete a couple of movie files to get the app on my 16 GB iPhone 3G. 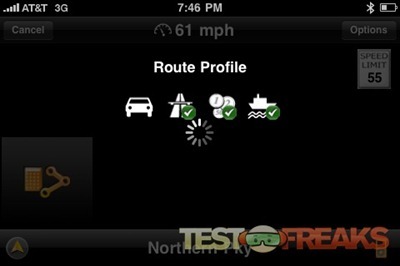 Depending on your iPhone, the speed of the Navigon MobileNavigator will vary. 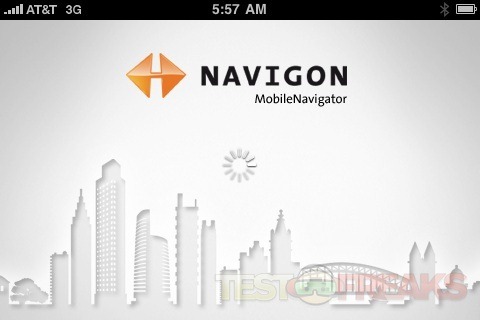 On my iPhone 3G the app took ten to fifteen seconds to load the Navigon home screen. Setting up a route took around ten seconds between route choices and route calculation. A nice feature of the Navigon MobileNavigator is that it calculates up to three routes to choose from including the My Route version which is determines the best route every time, adapted to your personal driving style, the day of the week and the time of day. Using the Navigon MobileNavigator was straightforward especially if you have used a stand alone GPS unit in the past. Navigon provides clear speaking voice navigation and exits are highlighted with virtual signposts well before you get to the off ramp. The ability to use one’s Contacts for address destinations is especially handy. 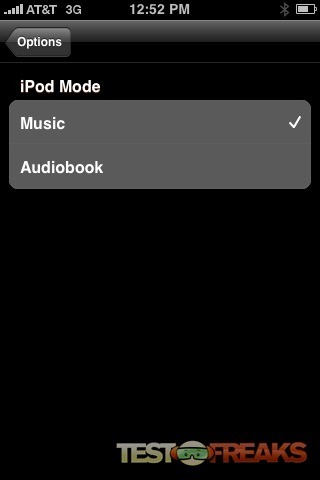 The iPod is easily accessed from the iPod icon on the bottom right side of the screen. 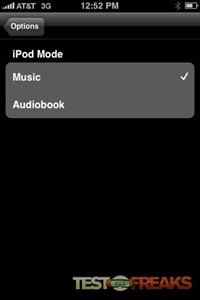 Pressing this icon will temporarily take the user to the iPod control screen where music can be selected. The app will pause the music when voice instructions or alerts need to be announced. The iPod feature is one that helps the Navigon MobileNavigator stand out from stand-alone GPS devices. Yes I know you can load music on many GPS units, but is not a feature on all of them. One complaint seen mentioned on the iTunes reviews of Navigon MobileNavigator was regarding the maps being outdated. I noticed this first hand when looking up POIs near my home. Several restaurants and stores that have not existed for years were shown as points of interest. Hopefully Navigon will update their reference maps in the near future, as a GPS is only as good as its maps. 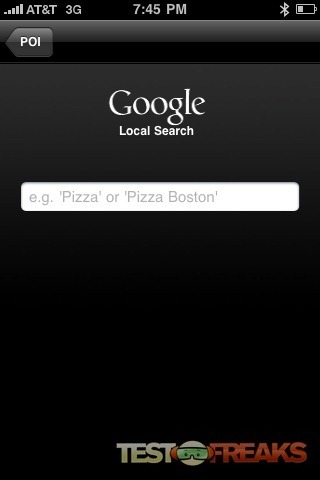 Thankfully Google Local is built into the app as an additional travel reference. One major drawback to using the iPhone as a GPS is the need for a car mount. 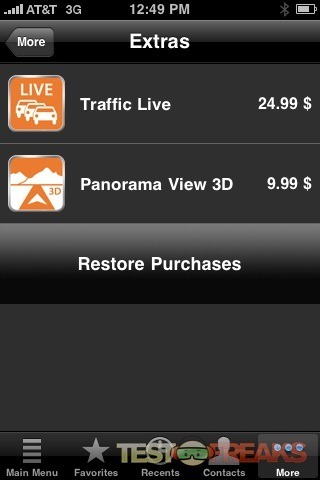 There are several options for this type of device but that does add to the cost of ownership of this app. Overall the Navigon MobileNavigator for iPhone is a solid GPS app that is constantly being updated. The current version if 1.50 and has had several updates in the past year. One thing to keep in mind when installing the app is the user needs to have double the free space on their iPhone to install the app; meaning 3 GBs of space needs to be available prior to installation. The main issue with the Navigon MobileNavigator is the lack of updated maps. A GPS is only as good as its reference maps so hopefully Navigon will be addressing this issue in the future. This factor keeps this app from being a total GPS replacement solution. The Navigon MobileNavigator offers some interesting features such as social network integration and iPod control. The Google Local search and the ability to buy Traffic Live makes this a feature rich GPS app. Unfortunately the outdated maps keep me from ditching my dedicated GPS unit. For now I will hang onto my Garmin Nüvi as a backup until the maps are updated. 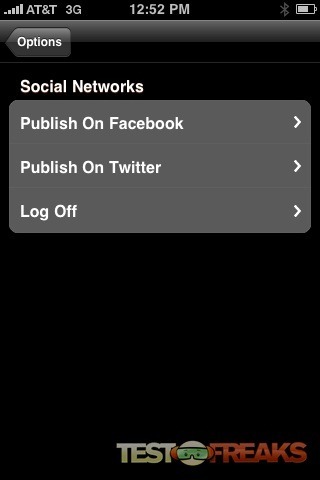 Navigon doen’t work wel under iOS4 (beta). De Maps are corrupted! So I hope there will be a update very soon!